If your child prefers to remain in church during the service, there are pew bags containing activities which are available from the sidespeople on duty. 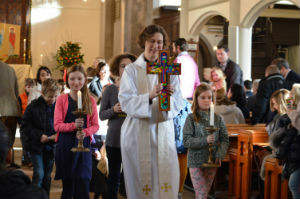 St Luke’s and Christ Church Sunday Schools form an integral part of the worshipping community of our united parish. We aim to create sacred space in which children and any accompanying adults can come close to God and learn more about our Christian faith. Parents and helpers are asked to model quiet and respectful listening, and to encourage an atmosphere of prayer and learning.